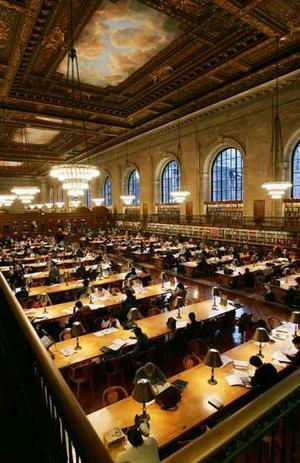 Neo-neo recalls her first visit to the Main Branch of the NY Public Library on 5th Avenue. Photo of the main reading room�on right, from her piece. NEA study says people aren't reading as much as they used to. Texas challenges "Everyday Math". NY Sun. When clergy make pronouncements about things they don't understand. I used to frequent a deli / gun shop in Auburn Maine. I liked being able to browse the latest Berettas while waiting for my Reuben. I always thought a combined alcohol, tobacco and firearms shop would be a fun store. ironic that a German newsweekly would sneer so--had Germany had a few more 'waitresses with highly-teased hair' selling guns back in say the 1930s, maybe Germany wouldn't have had that little spot of dictator trouble. "The whole method of the Clinton campaign is when anything derogatory comes up, they say the Republicans are spreading it. But there was no Republicans involved in any of my reporting on this," Novak said Monday. Whether Novak a is Rebublican or just leaning as Howard Wolfson says, I'd like to suggest the Prince of Darkness interview the Handmaiden of Darkness. Oh, fun is right, Leag o' Bloviations! I wonder who Novak is leaning against? Damn be him who drinks from the catapult of sin. Not reading the material will definitely limit any cogent response on students part. Oh, thank you so, Queag, Captain. I feel...so...so... spanked, as it were. "students" - needs an apostrophe. Did I pass, oh prickly pedant, thou?? A+ for META !! No apostrophe intended when adressing multiple persons. Pop quiz not popquiz quibbles vernacular. "No apostrophe intended when adressing multiple persons." ...students' part. That would be correct, my dearest sweetheart. You are addressing a 'part'. -5 for you, sugar britches. Stay after class. God, I love you so! I be redressing y'all's response, to wit failure to adequately address the subject of leaning, dearheart. Now, y'all's plan, bedeviling me fun be transparent. This beats eatin' chickin', sweetheart. How do y'all know when y'all've caught a fish? Must have been the glare prevented y'all's grasping how. After one knows fish enters another world.